Our training suite is situated in the heart of London's financial district. Public courses are offered based on a regular schedule of dates. For booking please Contact us. Exit Liverpool Street station by the Bishopsgate exit. 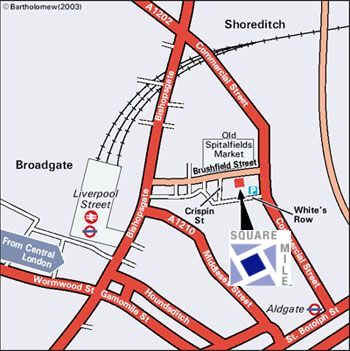 Once on Bishopsgate turn left (north), the third street on the right is Brushfield street we are locate 50m on the right. Car park - NCP White's Row (off Commercial Street).